Sept 1 - one of our readers said ... my dog killed two Possums in the last 24 hours in south Ajax Ontario! They stink! Sept 3 - Rich from Brighton, Ontario, said ... I saw one on our hot tub cover in Brighton Ontario. Sept 3 - Hydra from Scarborough reported ... about 20 minutes ago I went out to put out some trash and recycling and tere was a Possum on my front lawn at Warden and Lawrence, Scarborough, Ontario. Sept 4 - Miguel said ... I live in North Brampton exactly Bovaird and 410 and I spotted a Possum, it was really big and I was driving out of my street when it jumped out of the sidewalk and almost got run over by me. I managed to stop the car in time so it just rapidly hid under another vehicle and then I saw it coming behind it under a fence towards a backyard. It was around 12 at night. I just wanted to share my spotting. Thanks a lot Miguel from Brampton. Sept 4 - Clive from New Tecumseh said ... for several nights my dogs have been barking at the fence and reluctant to come in at bedtime. On the evening of 2nd September at midnight I went outside to the garage and saw what I am pretty sure was an Opossum at the edge of the parking area. We stared at each other for several seconds and he left. I believe it has been sleeping in my garage and there are paw marks on my car. Sept 4 - Victoria from Collingwood said ... a Possum found it's way into my Living Room, and was under a large Pine cabinet until dogs alerted me to something unusual! He was quietly removed with a net and was relocated away from my Collingwood, Ontario home. Poor thing survived the ordeal, but must have been very frightened. Sept 4th - Pattio said ... an Opossum was spotted tonight crossing the street in Pickering village Ajax. It was approximately 10 pm at night. I was happy he had already left my property as I don't want to encounter one of these little guys in the dark. Sep 5 - Laura Parker from Whitby said ... I saw one about a year and a half ago. Big fella. Saw two this weekend, big and medium sized. I guess they are flourishing here! Sept 7 - came back from shopping on September 7, and saw a Possum slowly walking across our backyard in North York. Sept 7 - Jennifer from Oshawa wrote ... so, I let my dog out last evening around 9:30 pm. He started barking and going crazy, running and jumping along the fence. I heard a rustling noise and assumed it was another Raccoons. To my surprise it was a Possum! The little guy was startled and didn't know what to do. He just sat there for over 15 minutes while I grabbed the flashlight and got to ogle in awe. It was very cute. Sept 8 - a reader reported ... 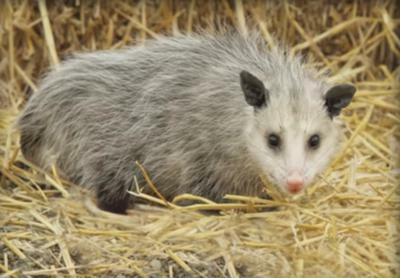 I was just walking north up St Clarens Ave from the Lansdowne subway station in Toronto, at 1:15 am Sept 7 and saw an animal I'd never seen before, which matches the description and photos of an Opossum!! It looked at me and quickly scurried away down a cement pathway between two houses. Sep 09 - One of our readers from Pickering village said ... I just watched a Possum crawl out of the garbage. In Pickering village on Church Street South. Sep 11 - Carolyn from Markham said ... I just noticed a new animal in my backyard. My house is on the edge of a 45 acre woodlot in Markham Ontario. I noticed a large rat shaped whitish animal with a pointed nose and rat-like tail foraging along the edge of the forest at 1:00 am. After a closer look I realized that this animal was too large to be a rat. It was more similar in size to a Raccoons but with less fur. It was, to my surprise, an Opossum. Thank you all for sending us these reports of your Opossum sightings in Southern Ontario - it looks like these little fellas have made themselves at home here! I will also post this on our facebook page so that our facebook followers can also enjoy them.